hyper-v 2016 management tools could not access an expected wmi class on computer …. – It`s simple when you know how ! 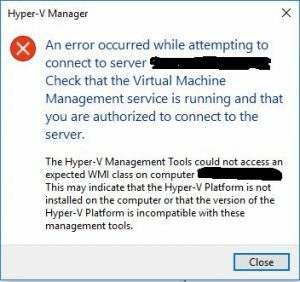 Home » Hyper-v » Operating Systems » Virtualization » Windows » Windows server » hyper-v 2016 management tools could not access an expected wmi class on computer …. After running this command the connection restored, rebbot the server if it doesn’t connect right after .